She had a few groups of friends; school mates, college mates, constant friends and a couple of new friends. She used to hang out with them from time to time. She had a different equation with each one of them and her own style changed as per the group she was with. With her school friends, she somehow became an intellectual who used big words and talked about how she was still pursuing her dream. With her college friends, she became a person obsessed with movies, TV serials, singers and bands. With her constant friends, she felt free. She didn't have to think twice before saying anything. And finally, with her new friends, she was still discovering who she was and realised she could be crazy, smart and emotional at the same time. No matter what, she always loved her friends. She would always take their advice on important matters. But, when she met her school friends a couple of years ago, she felt lost. She found their discussions and gossips utterly boring. They had changed over time but they still liked to talk about childish things that didn't matter. She felt disconnected. She met her college friends about 8 months ago, she felt lost. They only talked about things like fashion, who's dating whom, who broke up with whom and all the who's who of human crap. She felt disconnected. Along the past few months, she met her constant friends almost every week. But, somehow, they felt distant too. They had started to judge her decisions and instead of standing by her during tough times, they were too busy with their own lives. She felt disconnected. And when she only had her couple of new friends left, she knew that nothing could ever happen between them. She knew they would never leave. But, then, they were having dinner one night, and she had nothing to say. She got bored. She felt disconnected. As she walked home alone that night, she was lost in the vortex of her intense thoughts. 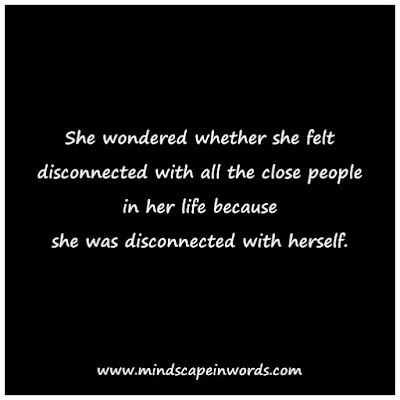 She couldn't figure out how she could feel so disconnected with all of her close friends. She couldn't understand if it was something she did or how she behaved. 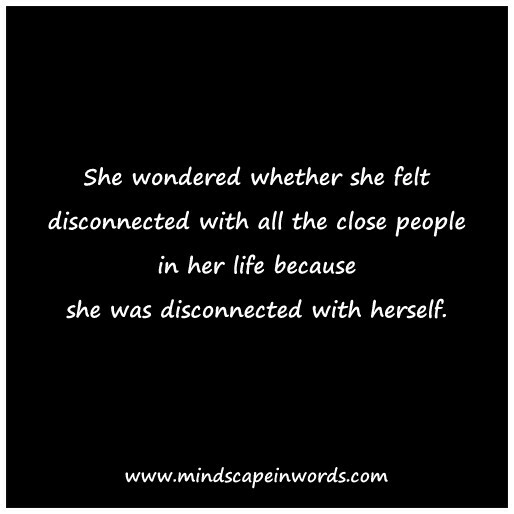 She wondered whether she felt disconnected with all the close people in her life because she was disconnected with herself. Did she need to connect with herself first in order to connect with others? Or was she so peaceful being alone, that the company of others had become unbearable? If she enjoyed solitude, was that the reason everyone kept leaving her? She was just lost in her thoughts. She knew, whatever happened, at the end of the day, she had to take the walk alone. Disconnection is such a weird feeling, but I've found it happens throughout life. I have to agree with Falon. 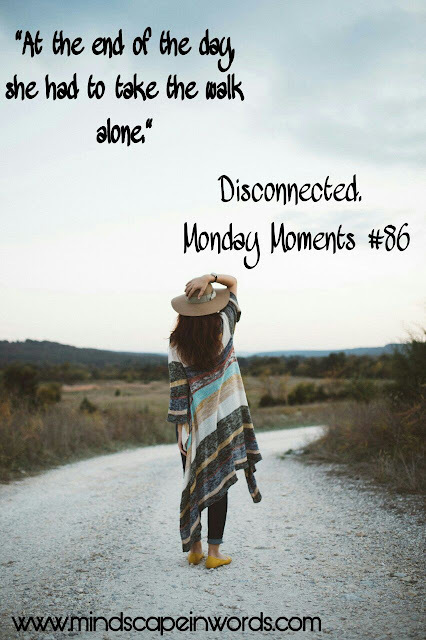 I think feeling disconnected is normal... it's a strange reality for many. It's definitely uncomfortable though. There is something so beautiful about this! We change throughout life and sometimes we simply outgrow friends and relationships we had once felt so connected with. This is so relatable! Too much of solitude could kill the person. Inner peace is all one seeks for. Once we get it everything looks so connected.